Blue With Beige Colour Silk Embroidered saree. 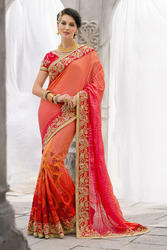 Add a small burst of colour inside your wardrobe with this beige & deep orange chiffon saree. The beautiful lace, patch work, resham, stones work all through the attire is awe-inspiring. We offer high quality range of Embroidered Chanderi Silk Saree that is made by creative professionals and at the same time perfect mix of modern patterns and contemporary designs. All the fashion in India starts from Bombay because of Bollywood. Bombay is famous for Bombay sarees. Bombay silk sarees are well known all over the world. Embroidered Bombay sarees have made a mark in the fashion world.